16858 North Perimeter Drive, Scottsdale, AZ, U.S.A. 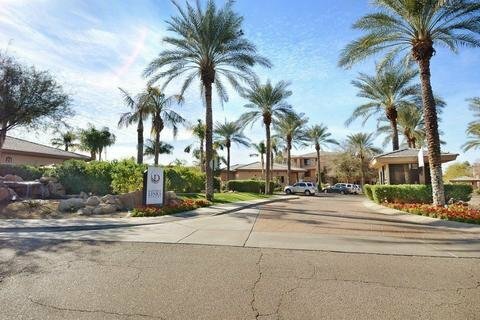 The Scottsdale Links Resort, situated in Scottsdale, AZ, is located 19 minutes away from Old Scottsdale. In this hotel, pets are not allowed. There are 3 floors with 228 rooms. Each room includes air conditioning, blackout curtains, climate control a microwave, cookware, dish ware, utensils, a kitchen, a refrigerator, a coffeemaker, a phone with voicemail and wake-up calls available, cable TV with a DVD player and a VCR available, toiletries. a har dryer, a shower and bath, paid Wi-fi, a clock radio, an ironing board with an iron, a sofa bed, cribs available, and a king and queen bed. In the Scottsdale Links Resort, there is free self parking. On-site, available is a steam room, a hot tub, fitness facilities, gift shops, a patio, a picnic area, and 2 outdoor pools. For the guest's needs, there is a concierge desk, business services, a safe at the front desk, a staff capable of speaking multiple languages, a 24 hour front desk, tour assistance, a laundry service with dry cleaning available, a video library, and barbecue grills. The Scottsdale Links Resort got very good overall ratings from guest reviews, with only a few complaints made. Many guests like the location. They felt that the hotel was at a convenient proximity to their favorite locations. Many guests praised the level of cleanliness and comfiness of their room, with very few complaints about the state of the room. Many guests were satisfied with the price they paid to stay at this hotel, as they feel that considering the value of the hotel, the price is fairly reasonable. Many guests made it clear that they enjoyed the amenities offered at the hotel, specifically the pool and the fitness facilities. There were very few complaints about the Scottsdale Links Resort, but there were still some reoccurring issues. As a result of there being no elevator in this hotel, a significant amount of guests complained about this, deeming it an inconvenience as there are 3 floors. Some guests found the sales pitch for a time share they had to endure to be an inconvenience. Some guests felt that the hotel was too noisy, complaints mainly emphasized that this problem came from the nearby busy street and the thin walls. Expedia.com guests rated this hotel 4.3 out of 5 and 92% of guests recommended it based on 354 reviews. Hotels.com guests rated this hotel 4.4 out of 5 based on 198 reviews. TripAdvisor.com ranked this hotel #52 of 78 Scottsdale hotels, with an average rating of 3.5 out of 5 based on 221 reviews. Rating: #4 out of 57 hotels in Scottsdale ranked by guests. "The amenities were on par with any large hotel chain and the fitness facility was much better. I found easy freeway access and there were enough restaurants and businesses in the area for convenience. For golfers, there was a myriad of good golf courses at reasonable prices and more at higher prices. Airport noise was not a factor unless sunning out by the pool or sitting on one's balcony. The grounds were well-maintained and covered parking was a bonus. I would stay here again without hesitation."